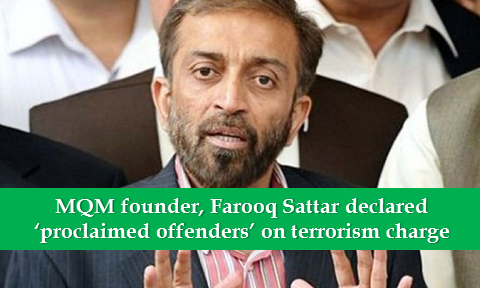 An Anti-terrorism court Sunday (today) declared Muttahida Qaumi Movement (MQM) founder, MQM Pakistan Chief Farooq Sattar and eight other party members ‘proclaimed offenders’ in a case pertaining to terrorism. The court ordered Farooq Sattar to present before it on November 21. MQM-Pakistan leader Amir Khan was also declared proclaimed offenders. The court was hearing the case upon FIR No 117, 116/2016. The ATC court number two also published the advertisement in special case no 1497, 1496/2016. One of the cases was related to the ATC had taken up was related to the August 22 violence in which a provocative speech by MQM founder had led to incitement to violence of workers.